Thanks to Mother Nature most plants will thrive for years without pruning, but people can easily ruin what she has created. The use of bad pruning techniques will leave healthy plants weak and misshapen. Left to nature, most plant life will ultimately be pruned in some way. It could be as simple as low branches being completely shaded by ones higher up. This results in the buildup of a “collar” around the base of the branch which will restrict the flow of nutrients. It will be just a matter of time until these low branches wither and fall off in high wind conditions. Many times tender young branches will be snapped off by wild animals nesting or looking for food. Over its lifespan, a plant that grows in nature will adapt to the shape that lets it make the best use of light conditions and climate. Proper pruning is a skill and you need to become informed so that you do it correctly. As crazy as it may seems, more trees die each year from bad pruning than from a pest infestation. Use for a rule of thumb the idea that pruning should be the removal of stems and branches that are no longer of any use to the plant. This corrective action is done to allow additional energy for the formation of fruits, flowers and new growth. A very basic definition of proper pruning is eliminating plant parts to increase health or value of the plant, or for landscaping aesthetics. After you’ve decided on your objectives, proper pruning become a simple matter of common sense. The need for pruning can be minimized by choosing the right plant for the site. Any plant material that will grow too big for the location will suffer over the years. With the large selection of plants available today you should be able to find a lovely specimen that will adapt appropriately to your North Texas landscape. Your pruning efforts should align with a well thought out plan. Think through the process and know why you are pruning before you make the first cut. If you make cuts in a planned order, you should be able to minimize the total number of cuts. 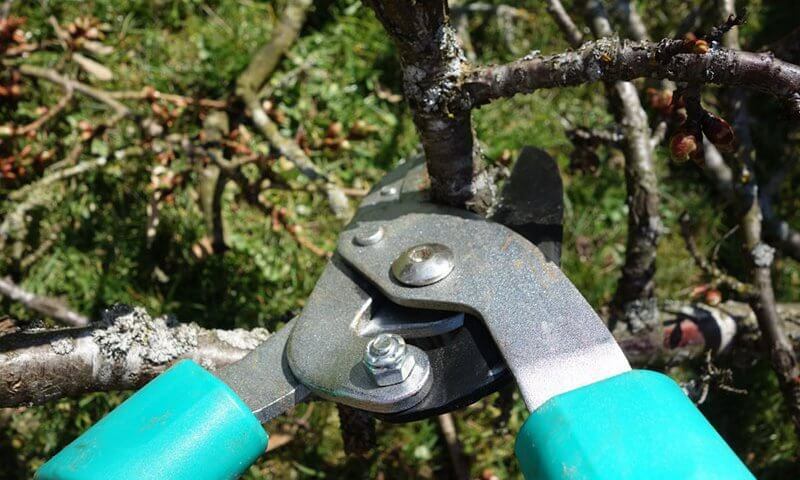 A practiced pruner will initially remove all dead, damaged or diseased limbs. This is done by making the cut at the origination point – or back to a healthy lateral branch. If this is done wisely, often the canopy of the tree or shrub will release adequately requiring no further pruning. If you want to make cuts to create a desired shape, you should first recognize the natural growth structure of the plant. Try to avoid cuts that will destroy the nature given shape of a plant. Many plants when randomly pruned will spend their energy trying to resume their former shape. As you are working on a plant, go slowly. After a cut or two, take a step back and review your work. A close scrutiny will help you decide if further pruning is necessary. Proper pruning can take place at any time of the year, but every plant will have different recommended pruning times. If you prune at the wrong time of the year it probably won’t prove fatal, but it can reduce the vitality of the plant. Pruning should happen when it inflicts minimal damage to the plant, not when it is most convenient for the pruner. The general thought is that pruning should occur in winter or early spring prior to the showing of new growth. There are exceptions, however, so it is best to do research on your individual plants and get familiar with their recommended pruning timeframe. This is particularly true for fruit bearing trees and flowering plants. Untimely pruning will reduce or eliminate the development of fruit and blooms. The pruning of certain plants will encourage new growth. If cutting is done before the last frost or late in the season, the new growth may not be strong enough to survive a cold snap. Also, you should prune plants that have been injured by storms as quickly as possible to reduce the risk of disease. The same holds true for dead limbs which are very susceptible to pest invasion. Proper pruning is both a science and an art – you need to do your plant research and then take pride in applying your knowledge creatively to your North Texas landscape. You will enjoy both the challenge and the results on your endeavors.